Remember all the Red Robin Kids Cookoff excitement last year? 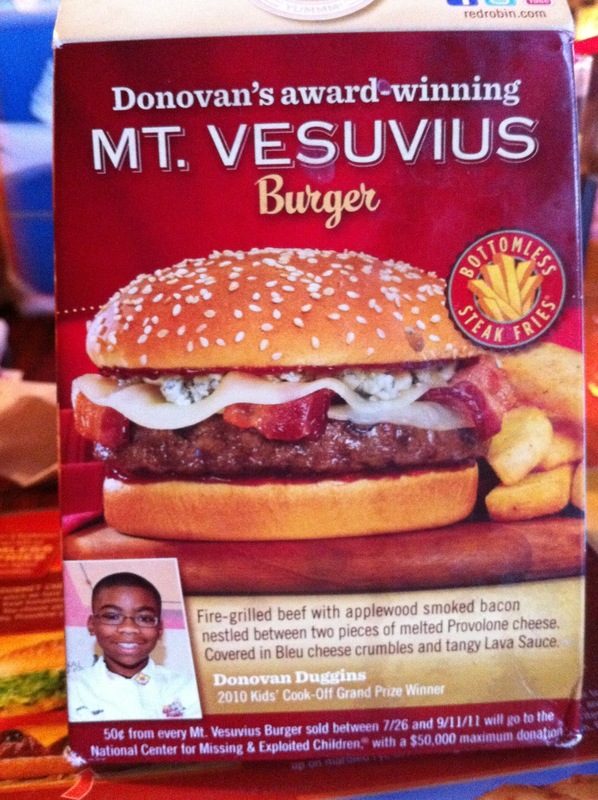 Well, it is my pleasure to inform you that Donovan's winning Mt. Vesuvius burger is available at Red Robin now through September 11th, with 50¢ from each burger purchased going directly to the National Center for Missing and Exploited Children. We visited our local restaurant, which is also Donovan's! How cool are these table signs? Jasper and Bob survey the menu. And here is the star of the show: the legendary Mt. 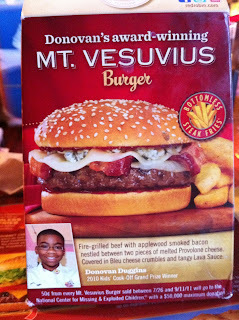 Vesuvius Burger! Download a copy of the Red Robin Kids' Cook-Off Cookbook with recipes for all 50 finalists burgers and try your hand at creating The People's Burger for a chance to win a year's worth of Red Robin Yummm Gift Cards and more– Donovan is one of the judges to impress, so be ready to wow him! To enter and win a Red Robin Yummm Gift Card, please comment on this post with your favorite item from their menu or the weirdest thing you've ever had on a burger. Entries will be accepted through Sept 14th and I'll pick the winner using Random.org. US readers are eligible. In accordance to the FTC Guidelines and the WOMMA Code of Ethics, I am disclosing that no monetary compensation was provided but I received a gift card from the sponsor for hosting this giveaway. Just so you know. The Whiskey River BBQ Chicken Wrap looks delicious! I have never ate at Red Robin. The weirdest thing I've ever eaten on a burger was a fried egg. Their never ending fries mmmmmm.... I can eat A LOT of their fries! We love Red Robin; their veggie burgers (they carry both Boca and Gardenburger--which is awesome) are so good, especially that you can substitute them on any burger. We just went to Red Robin tonight for the first time and I had the Sauteed 'Shroom Burger with blue cheese added to it, delicious and definitely a favorite of mine already. Thanks so much for hosting this wonderful giveaway! i love their guacamole burgers! I love their Burnin' Love Burger. 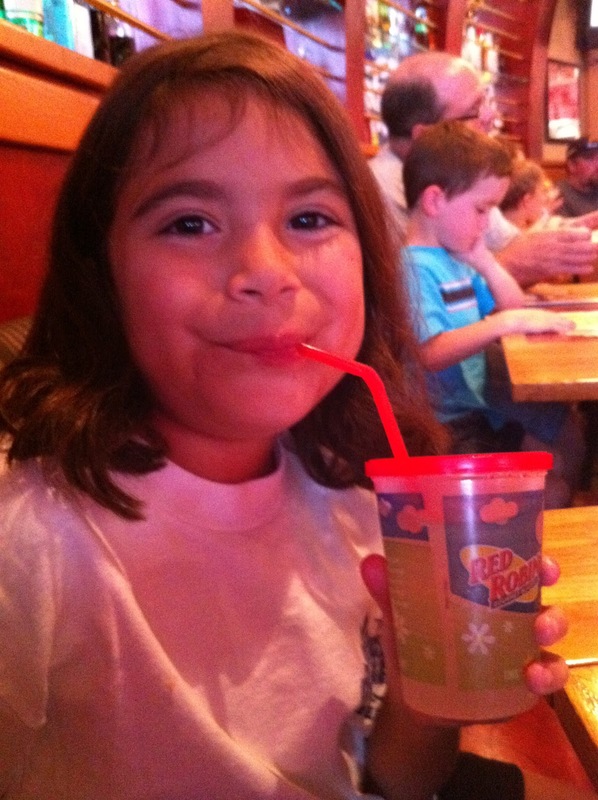 We love Red Robin! I like the Whisky River burger...now I am hungry for one. I also love their fries! I am already a GFC follower, and thank you for the giveaway! 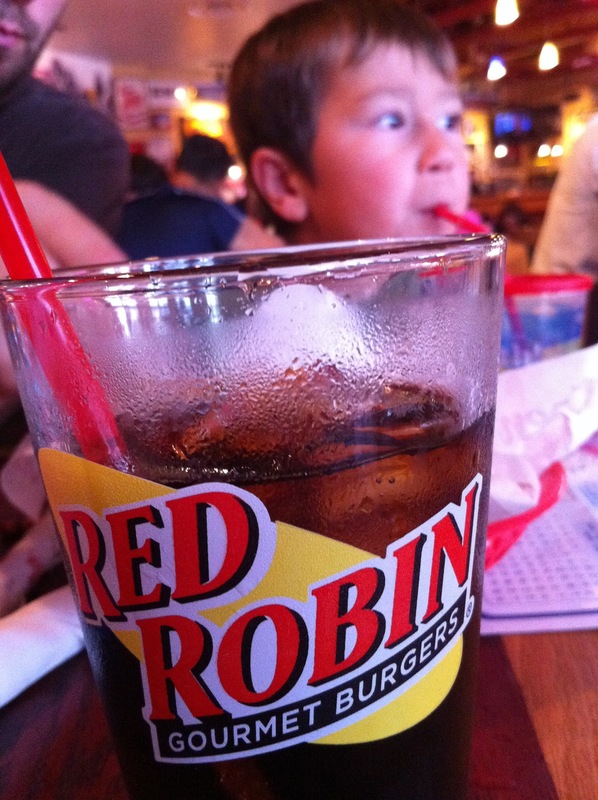 Following Red Robin on Facebook! the whiskey river BBQ chicken wrap looks tasty! The Royal Red Robin Burger is the best! I like Red Robin on FB under the name Mary Happymommy. love egg and grilled salami on a burger. My favorite item is the A.1. Peppercorn Burger :) *Thanks* for the giveaway! All this burger love is making us hungry! Red Robin... YUMMM! We actually went there tonight! They have a blue cheese burger that is absolutely to die for!!! But honestly, I've never had a bad burger at Red Robin! The weirdest thing I have ever had on a burger is an over easy egg! I like you on fb as Arianah Watts. I like Red Robin on fb as Arianah Watts.